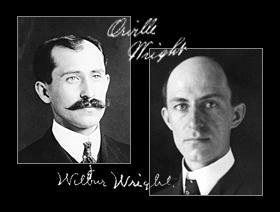 Wilbur and Orville Wright, the youngest of a Bishop's four sons, grew up in Dayton, Ohio. Gifted engineers and inventors, they (like most of their contemporaries) were fascinated by the idea of "heavier than air" powered flight. However, while their peers built increasingly powerful motors (figuring that the "flight problem" could be overcome by brute force), the Wright Brothers focused on the challenge of control in three polar dimensions: yaw, pitch and roll. Their engineering acumen came from years of working in their shop with printing presses, motors and bicycles -- the Gary Fishers of the 19th-century. Mechanical skill, coupled with a penchant for data collection (e.g., numerous wind tunnel tests to build better propellers and wings) led to U.S. Patent #821,393: the control surfaces that would later be called ailerons. On this day, 104 years ago (December 17th, 1903), Orville Wright (below) piloted their plane for a 12-second, 120-foot journey. The brothers made three more flights that day, the final flight (by Wilbur) more than 850 feet in 59 seconds. 6000 years to accomplish flight, and less than a century later we regularly toss people here and there by the millions at nearly the speed of sound. Amazing creatures we human beings.